DALLAS: Congresswoman Eddie Bernice Johnson, the senior most Congress person from Texas, said that the community of Pakistani businessmen and immigrants has played a big role in making America. Therefore, Pakistani Americans need to come forward and play their role in politics and make a difference in elections. This will help them in getting their voice heard and their issues resolved. She was addressing here at the annual meeting of the Pakistani American Business Forum. Eddie Johnson said that her relationship with Pakistani Americans prompted her to join Pakistani Caucus. She said that she is proud to be a sponsor of Ramadan Bill in Congress several years ago while a lot of congress members did not know anything about Ramadan. She said: “we have democracy in the country and everyone has a right of expression. However, it is important that the leadership promotes political awareness and use the power of vote to make the democracy work and improve”. She said that your political activism is important for your coming generations. She also said that she has hired a diverse staff in Washington D.C and here in Dallas. She said that she is thankful to immigrants that they came to US after leaving their ancestral homes and are building American economy and have introduced several cultures in US. Talking to the gathering, President Waqar Khan said that the Pakistani American Business Forum is focused on introducing business products of Pakistan into US and promoting American business products in Pakistan. Group’s chairman Hafeez Khan said that this group is a bridge for Pakistani American business interest. Plano city Mayor Harry, Anwar Azim, Riaz Hussain, Nadeem and others also addressed the gathering. APPNA’s ex-President Dr. Dawood Nasir said that he proposes to APPNA members to be part of this group. Nazia Khan and Riaz Hussain conducted the program, while it ended with a musical program. 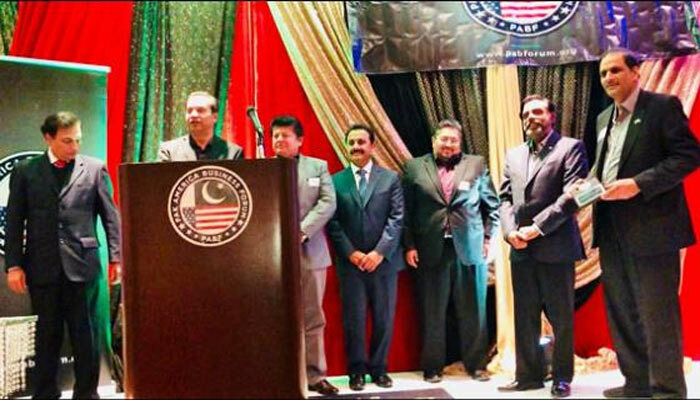 The event was also attended by American Muslim Democratic Caucus co-chairman Syed Fayyaz Hassan, who is also a candidate for County Commissioner in Tarrant County.